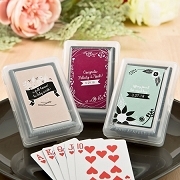 Requires assembly: attach stickers to the favors. 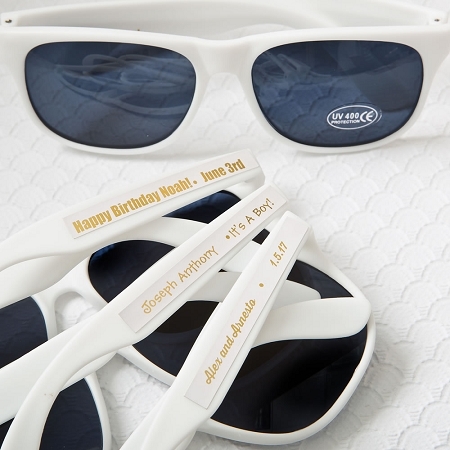 Let your guests turn your event into a fashion statement with a pair of personalized sunglasses! Add a fun touch to your event when your guests find a pair of sunglasses on their tables. These stylish glasses are made from a stylish white plastic and offer real 400UV protection. A gold sticker showing the UV protection level is displayed on the glasses. 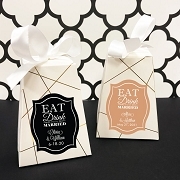 The sunglasses can be personalized with a classy metallic sticker, showing your guests name and the date of your event, creating a real designer accessory to be treasured for the memories. The sticker comes in white to blend in with the sunglasses and you have a choice of metallic gold or silver writing. Use our Design Previewer Tool to design your own sticker, selecting from our extensive range of themes and type styles. View your design creation online before placing your order. Everyone loves a great pair of sunglasses and these trendy designs from Fashioncraft are a winner. Great item, very fast delivery, best price i found! The only thing was that i expected the stickers to be clear, not white. But it really made no difference. 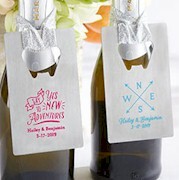 Im very excited to use these as my wedding favor.